Mmmmmuffins! To finish off my apple stash, I think I've perfected my apple muffin! I just love the addition of sour cream; it makes a nice rich and moist muffin, and really sets off the apple. Enjoy! - With a fork combine topping ingredients together until crumbly. - In another bowl, mix together dry batter ingredients, then beat in wet. - Place batter in greased or lined muffin tins, sprinkle with topping. - Bake @ 400° for 20-25 minutes. YUMMM! Another great apple recipe for me! Thank you! The muffins looks great. Great picture too! Thanks for sharing this recipe at Tasty Traditions. Have a great weekend! Darn, I was hoping it would keep him away, these sound great, can't wait to try them! I am so tempted to try it just by looking at it. Will do so soon. Your muffins look so good! Yumm!! Those muffins look super good! Ahhhh, I was just told this morning that I'd be getting another bag or two of apples and this looks like the perfect recipe for them. Thank you! 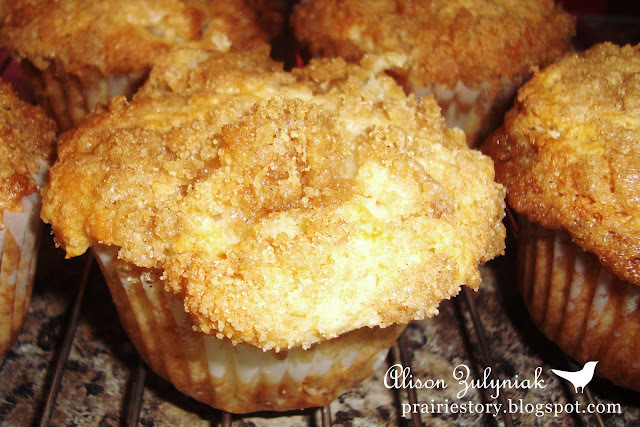 These muffins sound fabulous, love the streusel top and the addition of the sour cream. I make a apple muffin very similar and they are delish, I am sure these are just awesome! These sound scrumptious! Thanks for linking up for Friday Favorites! I have some sour cream that needs using - this is perfect! Thanks for linking this to Two for Tuesdays! Mmmm, my own apples are still a few weeks away from being ripe. But I can't wait to start cooking with them. These look so yummy; thanks for linking up with Two for Tuesday. I have this in the oven right now, can't wait 'til it's done. I do have a question though, is it supposed to be thick? The batter and the topping are very thick, I almost couldn't get the topping on it was so thick. I will let you know how it turns out. Thanks for posting. These turned out just pretty good, they did not have any type of apple flavor at all, maybe it was the type of apples I used. The topping is the best. Probably won't make again. These were good! I think next time I'd add some cinnamon to the batter to help carry the streusel flavor throughout. I'm going to try to freeze some of these so I can have them ready when the holidays roll around! And I used a mixture of 2 different types of apples. Yum!